We know that internet connections can be spotty when you’re working on your phone on the go. And we recognize that sometimes you need access to a file you didn’t remember to make available offline. 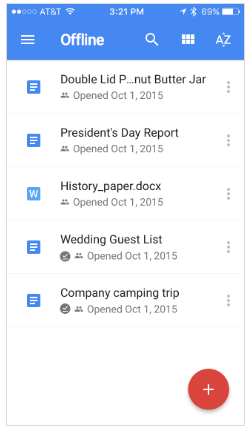 With this launch, we’ll make it easier to open Google Docs, Sheets, and Slides files on your Android and iOS devices when you’re not online. Starting today, any Docs, Sheets, or Slides files you’ve recently worked on will be automatically synced to your mobile device, so you can open them even if you don’t have an internet connection. As your documents, spreadsheets, and presentations go stale—or if your phone or tablet maxes out on storage space—we’ll remove those older files from your device. To see what documents are saved to your device and to access them later, simply select Offline from the overflow menu in your Docs, Sheets, or Slides app. This will show files synced both automatically and manually (note that manually synced files will now be labeled with a checkmark, instead of a pin icon).